Fr. Daniels: Tell us a little about the beginnings of Tradition in Gabon. How it started, when it started, what you found there. We also went to one of the Missions in Donguila where Archbishop Lefebvre himself had worked for two years. There, with the help of one of his old faithful, who later became Minister of Justice and also Ambassador in Korea, Mr. Valentin Obame, a Mass was organised, and we had at least 40 people. They sang the Mass of the Epiphany just like that, with no preparation. Just 15 minutes before the Mass they asked the Archbishop: “Which Mass would you like to sing?” And they sang practically by heart the Mass of the Epiphany. Amazing! Most of them knew it by heart. That played a large part in the Archbishop’s decision to open this mission. It was at this time that Bishop Ndong asked Archbishop Lefebvre: “Send us priests, we need holy priests. Here in Gabon, there aren’t any.” When Archbishop Lefebvre returned home it was decided that I would come to open the house in Libreville in January 1986. I arrived again in time for the feast of St Marcel, the 14th of January 1986. At first, I stayed at the hotel. The parents of Father Seligny, our Secretary General, lived in the area, so, while they were down South, I was able to stay in their house. Now I had to look for a house. Divine Providence guided us to the house where we now are. Once I had the house, the then deacon, now Father Carl Stehlin, joined me and we started the St Pius X Mission. After the June ordinations another priest joined us. We are now four priests at the mission, two brothers and five religious sisters. And at the school there are another 3 priests. Fr. Daniels: In the beginning, how many faithful did you have? Fr. Groche: At the first Mass that I celebrated in Libreville in 1986 there were 4 people, of whom three were white! But little by little it became known that we were there, at least through the owner of the house and also through Bishop Ndong, who, when he received visitors, would tell them about us. Then, the faithful started coming quite quickly. Fr. Daniels: You’ve been there now for 18 years. You started off with four people, and after that what was the growth rate? Fr. Groche: There was at first a constant growth. At the present moment there’s no growth, probably due to lack of space. In 1990, when we enlarged the church, we had about 400 people at Mass. Our old chapel could only accommodate 300 people. So many were outside. After we enlarged the church, in about a month it was full already. In that chapel there were about 700 places. We bought adjoining properties, and were able to enlarge still more and now we have a church with about 1000 seated places. On Sundays, we now have between 1500 and 2000 people. And for the big feasts, like Christmas, Easter.. well… for Midnight Mass we had easily 1700 people. We take all the benches from the Catechism classes and place them around the Church, because it was built in such a way that one can accommodate almost as many people outside as inside. As we can no longer enlarge inside, we enlarge outside! Fr. Daniels: Do you have many converts or are they already Catholics? Do you have many marriages, many Baptisms? Fr. Groche: Well, first the old people arrived with the other faith, and with them arrived the children and the grandchildren. So they of course did not know all this, but the Mass, the Liturgy, the singing they liked a lot. Many arrived that were not baptised, so after Catechism, they received Baptism. I think that up to now we have had more than 4000 Baptisms, children and adults. At present we have about 740 people enrolled for Catechism of whom 180 are adults. Fr. Daniels: And they are not yet baptised? Fr. Groche: Some of them are not baptised, others are preparing themselves for the Sacraments, either First Holy Communion or Confirmation, or they’re at Catechism because they want to learn Catechism, because they don’t know much. And we also prepare them for marriage. It’s marriages which we have the least, because of the difficulties we have with the Africans, which you know about, often due to their customs…Often the traditional custom of marriage imposes a dowry which is beyond the means of many, which often amounts to several million CFA francs. This is what delays the marriages, what complicates things. And there’s also the primary problem that the men, well, they like polygamy. And the State recognizes polygamy with up to four wives. So this does not make things any easier. Fr. Daniels: Do you have many Confessions? Fr. Groche: Well, of course, all those that can confess do confess. So in that area there’s been a definite progression since the beginning, especially with so many young people. And then there are all those that have regularized their situations, that’s about 100 people now. Not enormous, of course, but if we had not been there I do not know whether they would have thought of regularizing their situations. We hear Confessions every day, every evening. That’s when we have Mass for the faithful because they can get there more easily at that time, at 18h30. We hear confessions most evenings so it amounts to about 5 or 6 hours of confessions per week. It’s not a lot really. But on Sundays we hear more Confessions, almost the whole morning, and there are two or three of us. It works out to about three hours per priest in the morning and half an hour in the evening, so that’s 9 and a half hours. But out of 2000 people 9 hours is not so much. But they confess quite regularly. Fr. Daniels: Let’s come back to the Gregorian Chant you were telling us about. Do the Gabonese prefer Gregorian much more than the Tam-Tam? Fr. Groche: Yes. The people do not like the tam-tam at the Church. That’s for the village, for parties. While at Church they want religious singing and there’s nothing better than Gregorian. Polyphonic also. The priests looks after the two choirs: the Gregorian choir (St Cecilia) and the Polyphonic choir (St Gregory). Fr. Daniels: Do people in general sing during the Mass also? Fr. Groche: Yes, everyone sings. In Gregorian. On great Feast days, like Ascension, Easter, Christmas, Epiphany, they sing by heart. It’s very impressive. For example after the Midnight Mass, at the prayers at the foot of the altar and you hear the “Dixit Dominus” – it’s impressive! Then there’s the Kyrie, and at the Offertory we always sing a canticle, as well as after the Consecration and during Communion. It lasts a while. For them, to sing, is to pray twice. One feels that it is really with their hearts not just with their mouths. Fr. Daniels: Do you have any vocations from Gabon? Fr. Daniels: Do you find that you have to help out everywhere with the Sacrament of Extreme Unction? Fr. Groche: Yes, often. Firstly, we take Communion to homes, to about 60 people over a period of 15 days. It may have diminished now as we had a few deaths, but it’s between 50 to 60. We get called by day and by night. The people come, even those that are not of our faithful, because they know if they ring at our doorbell we will answer, and we will go, by day or by night. Whereas in the other parishes there’s no petrol to put in the car, there’s no money to buy petrol or they don’t want to go. And the people know we will go because they talk amongst themselves. Fr. Groche: No, always by car. There are practically no more horses. The roads are also not good, they are often very damaged. We have a parish 150 km away, called Four Blasse, which we go to every Sunday. There we have between 70 and 100 people. It is a village of 700 inhabitants. They are planters and they have plantations up to 30 km away. Some of them walk up to 15 km, even 20 km, to come to Mass on Sunday. Fr. Daniels: Do most Gabonese travel on foot. Fr. Groche: Most, yes. Most do not have cars. They are a fairly poor people, and they don’t always have the means. They often have many children, if not their own, those of the family. Fr. Groche: Well, we started this school, only for the boys, 8 years ago. We started with the lowest grade for the little ones, and each year we opened a new grade. Today we are up to Grade 8. Next year we will open Grade 9. In the first year we started with 8 pupils and now we have 170 pupils. We started at the Mission, in the Boy’s Catechism class because as we have 700 people for Catechism we had to build Catechism classrooms. So the girls are in the Catechism classrooms under the Church. Then we bought another property. The Mission is situated on a dead-end, so that we were able to buy various properties along the dead-end. So we bought and renovated a house and there we also have 4 Catechism classrooms for the boys. The girls and the boys are well separated. The Sisters look after the girls and the Fathers look after the boys. So the school began in the boy’s house. But at the end of the third year we had to find something else. They were becoming too numerous and there weren’t facilities for the children to have fun, for break periods, and so on. And that’s when during a Novena to the Infant Jesus of Prague we found this property, which was for sale, the residence of the Ambassador of the United States. We were able to buy it for a good price, despite everything. The Americans made a gesture of good faith towards us because it was for a school. Fr. Daniels: Are there any plans to start a school for the girls? Fr. Groche: Well, we’d like to start a school for the girls, but I don’t want to start with a Primary School if I can’t follow it up with the High school. I’ve already asked for help from the Dominican Sisters in France, but until they tell me: “We are coming soon,” or even in 3 years, I’m not starting. Because I don’t want to start and then have to let them go. Fr. Daniels: I remember reading in Archbishop Lefebvre’s book that several missionaries died from illness in Gabon. Do the priests still suffer from illnesses? Fr. Groche: At that time, when he was a missionary, there was no electricity, there were no facilities. Next to him we are missionaries living in luxury! Electricity, fridges, air-conditioning, all these things, of course, contribute to a better health. So, yes, from time to time some of our colleagues suffer from a bit of fever or malaria, but it’s quite rare. Personally, in the past 18 years, I’ve never had malaria or anything like that. The climate is very difficult. Archbishop Lefebvre used to say that in Gabon you need twice as much determination to do half as much work! Because of the climate. Fr. Daniels: So, after the beginnings, after a year or two, how did the modern clergy react to you? Were they against you? Fr. Groche: Straight away, the clergy did not agree. The Archbishop of the diocese was very unhappy with us. He tried to get help from the President, but the President had given his agreement to Archbishop Lefebvre when he saw him in 1985, and again in 1986 with Bishop Ndong and myself. So it was hard for him to say no when he had said yes to Archbishop Lefebvre already in the presence Bishop Ndong, (who died in 1989 on the eve of Monsignor Lefebvre’s 60 years of priesthood), with whom he was on good terms. Archbishop Lefebvre asked for the intervention of Chirac who at that time was Prime Minister of France, and through various diplomatic ties, the President was told: “Don’t worry, they are rather contributing to order than disorder” And that’s how it was solved. Fr. Daniels: And as for the modern Church, does it appear that they are starting to disappear, little by little, because of their own modernism. Fr. Groche: It’s difficult to say because the average African man is quite religious. Of course, if he has enough knowledge, he won’t go just anywhere. But because of his religious spirit, if he is not satisfied somewhere he goes somewhere else. And the fundamentalist churches do a lot of damage. And because the Modern Church does not give spiritual and intellectual matter to defend oneself, many of them go into these fundamentalist, Protestant churches. The Catholic churches are nonetheless still very full. According to our faithful there are less people in the Churches than previously. There are more people today in Libreville, there are more Churches, but there are proportionally less people in the Churches. 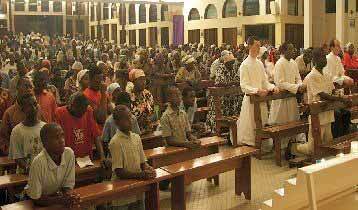 If, in Libreville, permission was granted to all the priests to celebrate the Old Mass, I think everyone would be happy. Fr. Daniels: Are there modern priests who desire to say the Old Mass? Fr. Groche: The modern priests, not the Holy Ghost Fathers. They are too bad. So, it’s the diocesan priests, the African priests, I don’t know them very well, but I think that among the younger ones, there are quite a few. In February we had the visit of the seminarians of Libreville, the final three years, so that’s the theological part. They came to visit our Mission, about 10 of them with their teacher. They came in cassocks – disguised for the occasion! They came to see what a Traditional Church is. I wasn’t there but they visited everything and were interested and surprised to see in the Sacristy the names of John Paul II and the Bishop, because they’ve heard so much against us. Some of them had already come to our Mass, a bit in secret. So there is a work being done. And we also have the advantage that 3, 4 or 5 times a year the television comes to record our Mass and then they show it on a Sunday. We are part of a circuit that shows Mass on Sundays on T.V. Fr. Daniels: Is it through your initiative or theirs? Fr. Groche: Theirs, but there are some of our faithful who work at the television. Even the Director General was one of our faithful. But before he came to us, and even now that he’s no longer there, it’s still being done. Usually it’s on Sundays. So we’ve already had Pentecost, the Christmas Mass, Easter, Medard’s first Mass, Pierre Celestin’s first Mass, with the Bishops, for the Confirmations. Sometimes it even shows two Sundays in a row. So, of course, it does a great deal of good in the whole country. 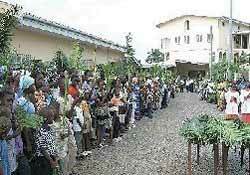 St Pius X is known throughout Gabon. It’s an apostolate. The Bishops are not very happy. Fr. Daniels: Are there many Muslims in Gabon? Fr. Groche: There are, but they are foreigners. Unfortunately in Gabon there are many foreigners. 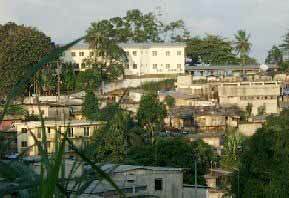 The government realized a few years ago that in Libreville, with a population of 450 000, about half are foreigners. They come from West Africa and most are Muslims. The Gabonese love doing administrative work but not other jobs! The President himself is a Muslim, and each year at Christmas, and also at Easter, he sends us his wishes, with flowers. We aren’t the only ones but we’re on the list. Fr. Daniels: Let’s talk a little about the foreign missions. You have spoken about the Mission, in other words the Priory, the School, and one other mission, and other than that…? Fr. Groche: We visit groups in the area of Lambaréné and Oyem Lambaréné is a former fief of Archbishop Lefebvre, in Gabon, and Oyem is in the north of Gabon. Monsignor Ndongo was first Bishop of Oyem. We also go to Cameroon where we have two groups of people. One in Douala and one in Yaoundé, the capital. They are French-speaking. Bilingual French-English. Fr. Daniels: You are not going as far as Nigeria? Fr. Groche: Yes, Nigeria and Cameroon. In Nigeria, in the former Biafra region, in the south-east, we have a group of about 40 people. Also in Senegal, although we have nothing established as yet, there are people to whom we go. Fr. Daniels: Finally, what do you see for the future of the Society’s work in Gabon? Fr. Groche: Well, to continue to develop our school, of course. We’ve started a first stage of enlargement for the priest’s accommodation, in view of the future. Also, the accommodation for the religious sisters. 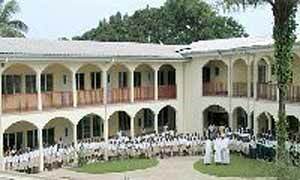 Normally, we should be building another section with about 10 classrooms for the secondary school, with a refectory and an adjoining kitchen. And we also want to extend the chapel because it’s already too small and people have to stand outside. Otherwise, our future is rather to open something in Nigeria and in Cameroon. Of course, if we had more priests we could open other things. Benin is asking for us, so is Togo, so is Ivory Coast as well as Senegal. Well, everyone’s calling us for help.